Casa Vista Hermosa or Unit 8310 is located on the 3rd floor of building #4. A gentle ocean breeze, beautiful white sand beach is waiting for you. Imagine yourself enjoying your days under a palyapa with a cool drink and a good book. It won’t take you long to shake off your stress and get Cozumello. Relax your days away on our private white sandy beach, a swim in the blue Caribbean waters. Or if you prefer fresh water try relaxing by one of the two HEATED private pools. The beach, pools & pier are all just a short distance from building 4. If you're a scuba diver you'll have the luxury of being picked up and dropped off at Residencias Reef's own pier. Your Cozumel vacation rental includes our private balcony that overlooks the main pool and the ocean where you can watch the sun dip into the blue waters of the Mexican Caribbean. Cozumel sunsets are picturesque and whether your enjoying it from our balcony or the rooftop solarium; you’ll have a front row seat. You can start your day off enjoying the sunrise; or top off the evening watching the sunset on your private balcony. A short nine mile trip to San Miguel you'll find many restaurants that offer a variety of foods including authentic Mexican cuisine. After a relaxing dinner, stroll the ocean front main street where you'll find the perfect piece of jewelry or souvenir to remember your trip to Cozumel. If staying home and cooking is for you we have a full kitchen with granite counter tops, stainless steel appliances and beautiful wood cabinets. Enjoy your private home entertainment system consisting of US satellite (DISH network/NY feed) with dual receivers to enjoy different programming on the two TV's provided. A 42' Plasma TV with surround sound,(bring your favorite CD's) DVD player & wireless internet (bring your laptop). FREE long distance phone service (Vonage)) to US and Canada available for your personal use. This 1000 sq ft unit offers 2 air conditioning units and ceiling fans for your comfort. This spacious one bedroom includes a king size bed and plenty of closet & drawers for your belongings. For your comfort and protection, we offer a safe to lock up your valuables.The large bathroom is fully tiled with two separate entrances for privacy from the bedroom. Two sleeper sofa's or an inflatable mattress for extra comfort is available for additional guests. All linens needed are included. There is a (220) washer & dryer in the condo with detergent available for your use. Daily maid service (no Sundays) is INCLUDED, but not mandatory to use. An authentic Mexican dinner can be prepared for you by our staff upon request for an additional charge plus the cost of groceries. A full menu is provided to choose from. They will serve and clean up afterwards so you can relax as if in your own restaurant! As owners; we take pride in providing what you may need to make your vacation a memorable one. Your comments and suggestions are graciously accepted. You can even enjoy the amenities of the Sabor Cozumel Resort and Spa (for a daily all-inclusive rate) next door for a change of pace. Enjoy a romantic dinner at the 5-star Aura Hotel or enjoy a cocktail while relaxing in their rooftop jacuzzi (pay per meal or cocktail). Whatever defines paradise for you can be found at this beautiful setting. What more could you ask for.......Cozumello. My wife and I, along with our two boys live in Northern Colorado. Patsy is an independent dental hygienist and I'm retired. Our son Dustin owns a contracting company in the Boulder area. Our son Matt is a student at Colorado State University. Our lives have been enriched by the people and their culture that surrounds this beautiful island. We first visited Cozumel while we were on a cruise ship back in 1996. We came back again the following year and we loved the island so much we just kept coming back. Since we were spending so much time on Isle of Cozumel we looked into buying here. We bought our condo back in 2005, right about the time hurricane Wilma hit. We were able to start renting our condo in Jan 2007. 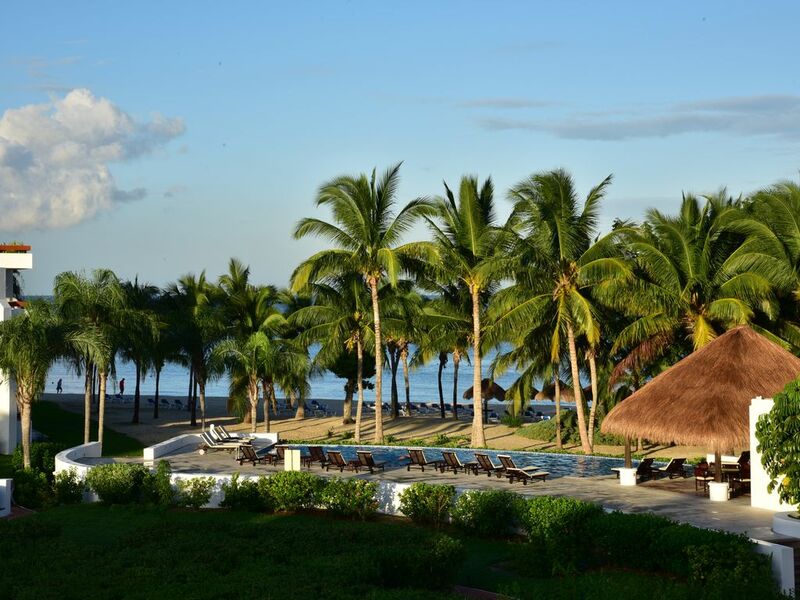 It's hard to beat the view of the pool & beach from our balcony. The property has two private pools & private beach area. Our condo is setup with stainless steel appliances, cooking equipment, American DISH TV service, wireless Internet & large screen TV (living room) with a second TV in the bedroom. Large shower stall with glass block and two bathroom sinks. Plenty of towels and beach towels included. Vonage phone service which offers FREE long distance to US & Canada. Plenty of bath towels, washcloths and beach towels. Guest library-leave a book/take a book. Children's coloring books. Also library located at main pool area. Private balcony available to enjoy sunsets or coffee in the mornings. This unit is personalized with homey amenities to help make your stay comfortable. Private balcony provides comfortable seating to enjoy the beautiful surroundings. Convenient /quick taxi service can be arranged using the in-house condo phone. Phone connects directly to the security gate. Security guards walk the gated community 24/7. Housekeeping service included daily except Sunday. Guest book available with suggestions for island activities and previous guests recommendations. Cooking service (menu provided) available for an additional charge upon request ($15 US per adult & $5 per child (14 & under) plus cost of groceries. Owner's manager available for questions or concerns as they arise. Unit 8310 at Residencias Reef is located on the top floor of building #4. This unit offers spectacular views of the ocean/beach and surrounding grounds. The complex has two private (heated) pools, beach area with lounge chairs and plenty of shaded or sunny areas. Enjoy walking along San Francisco beach to find water sport/food and activities at Paradise Beach clubs (closes at dark). Daily housekeeping (except sunday) & bottled water INCLUDED. Additional fees may apply when book more than 2 adult guests. HOLIDAY RATES (Thanksgiving, Christmas, New Years, Easter and Spring Break) may apply- please inquire with owner. CANCELLATION POLICY: 100% refund IF dates are re-booked by another guest-minus $100 booking fee.